So the other day I wanted to send general feedback to Alaska Air and they made it so difficult that I blogged about it. As generally happens these days companies search for their names and try to help when they find a complaint on a blog so as you can see I got told my someone from Alaska Air to just go ahead and use the "Post Flight Comments" form and just ignore the sections about which flight I was on. Do they seriously think that all that kissing up and obvious cut I paste helps me? Thanks for the feedback regarding the enforcement of the hand luggage sizes. Alaska Air is so worried about losing market share we would rather annoy the few passengers that follow the rules than risk offending the majority of people who think that a hippopotamus will fit in the overhead bins. Rest assured that the only way to avoid this is to make sure you are one of the first on the plane so turn up really early. However we can't promise that one of our staff won't be overly helpful and remove your small bag from the bins and ask you to put it in your foot space so that the lady with the blimp sized purse can avoid 10 minutes when she gets to the other end. I guess there's always Southwest - do they still let the Pilots make funny announcements? Yesterday I was reading how the new Virgin London Marathon site was having trouble handling the volume of people who want to enter the 2010 race. Its no surprise - the 2009 was on Sunday so there's lots of people feeling inspired - many of of which will probably live to regret their enthusiasm and many of whom will do something that amazes themselves. I visited the site and found that due to the time differences everyone in the UK was asleep and the site was running just fine. Of course it is a lottery - last year there was 120,000 people in the lottery and 35,000 finishers many of whom get in through charity, club or fast time programs (I would need a 3:15 so that's not happening) so I am guessing that I have a 1 in 6 chance at best. So maybe this accident won't be a problem. Plus I think if you enter so many years and don't get in then they guarantee you a place so that's another good thing. The lottery results are in October. "It is the only Marathon course in the world that is run in two hemispheres, both the East and West, as the full course crosses the Prime Meridian in Greenwich." We recently had my cousin and her husband to stay and you know what that means right? 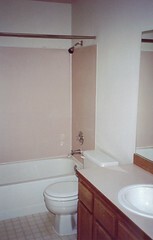 Yes it means its time for some DIY to make a bathroom we never use look pretty. Sometimes guys its best to just say "Yes honey"..
Paying someone to do all of this is outside the budget and J thought 'it might be fun' to do everything ourselves. The guest bathroom has has precious little done since I moved in in 1999. 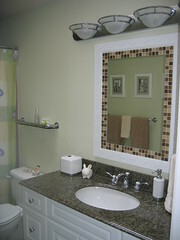 The walls have had a coat of paint and I replaced the vanity, sink and taps during a remodel 4 years ago. 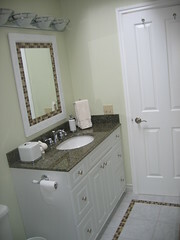 However the new vanity was slightly smaller leaving a 3 inch gap in the lino and a rather messy patch job on the wall. 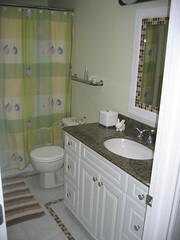 Here's the bathroom on move in day, and with the new vanity and the lino removed to assess the damage. 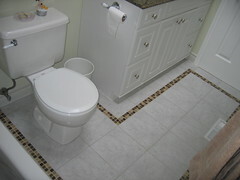 After a very good class at the Home Depot we went and got our tiles and supplies and a very merry 3 weekends we had. I've heard you discover things about your partner during DIY projects - I learned my girlfriend is scared of the hole in the floor where the poop goes. According to my Latin dictionary this is called fecavusaphobia. Mostly the tiles went down very well - I think we only miss cut about 3 so badly we had to redo them and mostly they were because I either can't measure or I measure one thing and then call out an apparently random number. J became very proficient on the tile cutter. 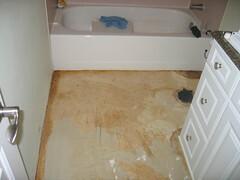 I got to use my tile saw that I bought 5 years ago and never used because the contractor offered to do it really cheap. I also got to use some towel rails etc. that I got for Christmas 15 years ago for a house I no longer own. Yes I've carted them around with me for that long. See how procrastination can pay off if you give in to it! Some of the edges near the walls were not as straight as I would have liked but when you put the baseboard (UK: Skirting board) back on and apply a generous bead of caulk its pretty amazing how the mistakes are not even noticeable. There were some interesting cuts around pipes and the vanity that tested my limited carpentry skill. We had plenty of the glass mosaic tiles left over - they come on sheets with backing so no we didn't lay each one - and J found a design on the internet that we adapted and made our own mirror. This is where I learned that just because she is smart enough to sequence DNA and cure HPV over her lunch hour doesn't mean she can do the math to mark the mirror design up on the plywood. She is better at designing things than I ever could be so I guess its only fair we share the other jobs and I get to do the divide by 2 stuff. Oh and I also learned that using a Dremel as a jigsaw is not a way to get a nice cut but it will work! I had to remove the toilet and the seals inside appear to be original - they either disintegrated or were embossed on such that I had to scrape them off. I broke the head off the stop tap too so I had to replace that and rebuild the entire toilet. I'm amazed to say that it went smoothly, I had no bits leftover and there has been no leaks even 4 weeks later. And finally I changed the light. I think there is only one original light left in the house now from when I bought it. They were all originally what I like to call builder specials. i.e. the house builder got a job lot of the cheapest lights they could get away with. The new light is very snazzy and best of all was on sale. I see on the TV this morning that Alaska Airlines, who I mostly enjoy flying with, made a big loss and also announced that they will be charging $15 per checked bag going forward. I'm sure 90% of people will start whining just like they did when other airlines added it but to be honest I don't care - as long as you know in advance you can just figure it into the overall price. Fact is that almost everyone shops for air travel on price no matter what they say they do so airlines don't dare actually put their prices up enough to make a profit (or at least avoid a loss - seriously how is it ever OK to lose $19 million) like a normal business would because unless ALL of them did it then they wouldn't seem competitive. So instead they charge you a loss making amount up front and make up the difference elsewhere. Stupid fees, security tariffs, fuel surcharges that never go away... but at the end of the day its not too hard to work out the total. Totally annoying but pretty much everyone is, or soon will be, doing the same thing. Anyway, I digress..... I thought I would send Alaska an email saying 'Guys I want to keep flying with you, shame about the $15 fee but can you please enforce the hand baggage size and limits if you are going to do this.' I think its unlikely they will listen to me but I'm an optimist. But you can't - there's no way to send general feedback to Alaska air online. Try it - go off to the http://www.alaskaair.com and find me an email address or a web form that is applicable. I found a form for reporting technical issues on the website, I found a form to complain about your flight that needs flight details... I even tried using my google skills to find an undocumented email address. Nothing. I have a mileage plan card which has several flights and the credit card and even in the members section there is nowhere to contact them. Isn't it great that in 2009 I'm expected to pick up a phone, listen to music for 20 minutes and probably fight their phone system and people to try to find the right department. My guess is that so many people complain abut airlines in general that they simply remove the easy options to stop people contacting them. As I said I am taking things pretty easy this year after running 4 marathons and an ultra last year. I ran part of a 3 hour trail run relay a month ago and while letting a faster runner pass me I twisted my ankle very badly and it swelled up really quite nicely. Thankfully its only certain positions I can feel it so long slow runs have still been possible. Speed stuff still aggravates it 5 weeks later and even worse its weak so I keep retwisting it - sometimes bad enough to swell up all over again. Coming up will be a nice easy half marathon in Tacoma where I will pace J and get my first half of the very cool medal which comes in 2 halves. Yes that means I have to run it again next year to get the other half. What a great sales tactic! In June will be the inaugural Seattle Rock and Roll and my first full marathon of the year - the final course turned out not to be as nice as I hoped. The last half is run on I99/Alaskan Way viaduct which offers some great views for the tourists but if its hot offers no shade and very hot. Lets hope for some crappy June weather in Seattle. Over the summer I'm going to miss the triathlons this year in the hope that I can afford to buy a new bike for next year - instead its time to improve my swimming and go over a mile with the 1.2 Mile Fat Salmon (J might swim the 3 mile for the 2nd time - see THAT'S crazy) and the 1.5 mile Park to Park swim across the Lake. Last time I swam a mile I was probably 16 and I breast stroked the whole way. I think it used to take me over an hour. For the Fat Salmon I need to swim the 1.2 miles in under 45 minutes which shouldn't be a problem but its right up there with running my 1st marathon for me. The Park to Park is even more nerve wracking - the other races are almost always close to the edge of the lake - as its name suggests this race goes right across. There's plenty of safety boats and stuff but its a long way without touching the side! But I still need running goals to motivate me through the year so I've decided that next April I will run my 1st big boy ultra - A 50 MILER. Yes the 50k from last year is only 5 miles further than the marathon so it was merely a warm up. Next April I will go for the 50 miler at the Mt Si relay and Ultra. There's always the 50k to drop back to if I can't get the training in because its going to mean some serious training miles. This is a 19 mile increase over the 50k and almost 2 marathons back to back. Its probably going to mean running for around 10 hours which means eating 2 meals on the go - Mmmmmmm bacon. I did the 50k on the same course and I worked out that I will have run 35 miles before I hit the turnaround point at half way on the 50k. I'm sure there's another hundred OMG moments I will think of in the next 12 months. The training will involve several 50ks at the end of this year/start of the next. Yes I know... crazy eh?